I was recently chosen to become a Salesforce MVP! This program recognizes exceptional individuals within the salesforce.com community & social channels for their leadership, knowledge and ongoing contributions. This is a select group, chosen three times a year, that exemplify the Salesforce community. 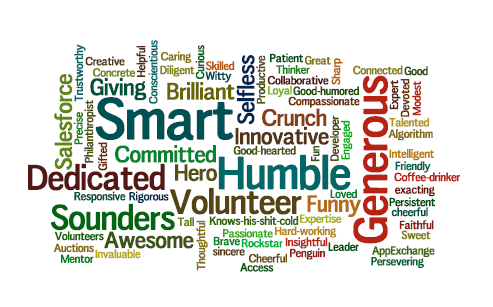 My former colleagues at Groundwire recently hosted a thank you party for me, and presented me with this great Wordle. I liked it so much I just had to share it out, but I’ll probably have to reduce the size of “Humble” now!